Today, two of my girlfriends and I took a little field trip to the Dekalb Farmers' Market in Atlanta. Wow! It was incredible! I can't believe I haven't been there before. While we were there, I picked up some fresh blueberries, purple potatoes, organic milk, dill weed, bananas, regular potatoes and fresh mint. This week for the FNCCC at I Blame My Mother, we're working on Chef Robert Irvine's recipes. I love his show Dinner Impossible. He has to create dinner on the fly for usually a large group of people. He comes up with some really great ideas. I kept it simple this week since we have a ton of strawberries to use up. I chose to make his Berry Banana Smoothies. I didn't have any frozen yogurt so we just used our regular yogurt. But I used some of the frozen strawberries so that made up for the lack of ice and frozen yogurt. I also halved the recipe since I was just feeding the kids and I.
but it added a nice subtle flavor. Be sure to visit I Blame My Mother to see what recipes others are whipping up! YUM! 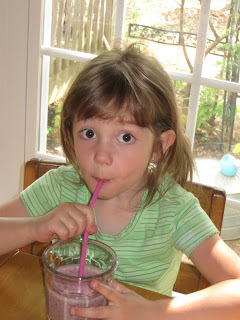 I made smoothies yesterday morning, but I'm sure fresh fruit is better than frozen! My mom uses purple potatos for a Filipino dessert! I've never seen it in anything else! What are you gonna do with them? Nothing better than a good smoothie!! Looks like a great breakfast. Yummy! With the warmer weather we've been having, I'm ready for smoothies :) This recipe looks delicious. 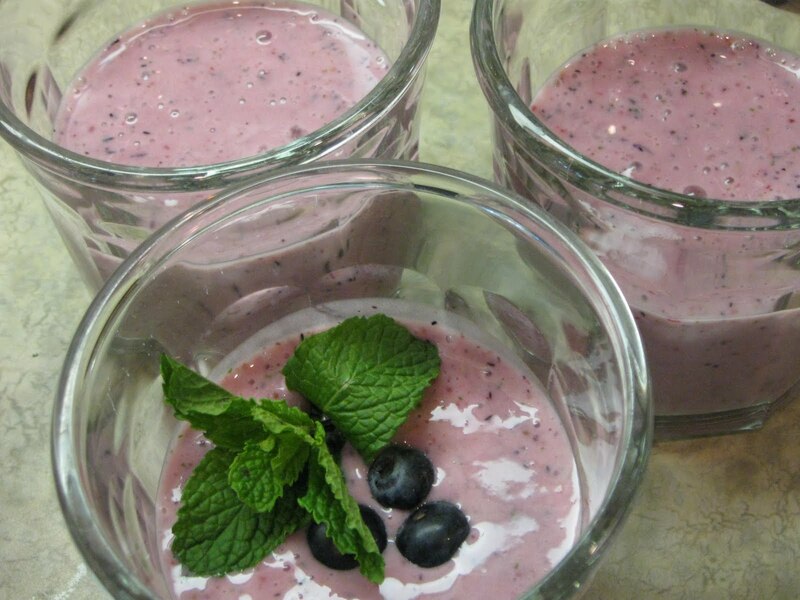 I love smoothies and I'll be trying this one! 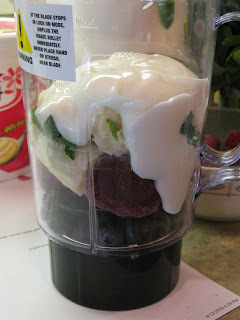 I love having smoothies for breakfast I just hate cleaning the blender! @Kathleen - I know what you mean! But SnoWhite is right. I try to remember to rinse it out. 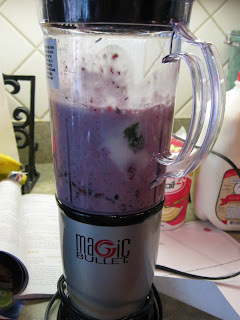 I love the Magic Bullet because when you remove the blade, there's enough room for your hand and arm to clean it all up. It's great! Oh yummy. I'm with everyone else I love smoothies. Looks delicious glad you guys loved it, and that farmer's market sounds fun. I've always wanted to plant purple potatoes, lol. I make smoothies almost daily. Will have to try the mint! These look great! I thought the mint sounded like a good addition so I'm glad to hear it was! Mmm...looks yummy. I'll use soymilk instead as my kids are lactose intolerant. Thank you!